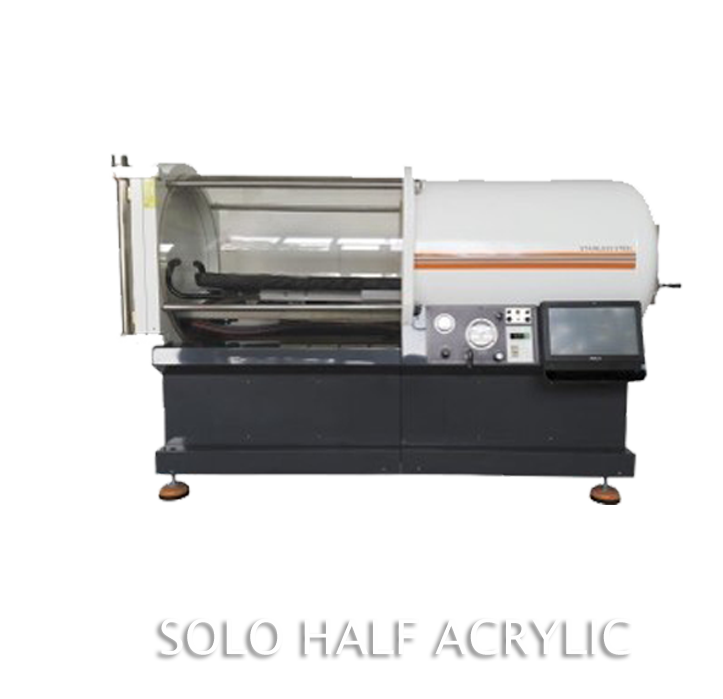 Hyperbaric Chamber is a medical device used to perform treatment with Oxygen at greater pressure than normal atmospheric pressure defined as 1ATM. The undersea and Hyperbaric medical Society (UHMS) defines Hyperbaric Oxygen treatment as treating 100% Oxygen delivered at pressure greater than 1.4 ATA. Hyperbaric Medicine is based on significantly increasing the level of Oxygen O2 in the blood generating the strong Hyperoxia adequate for medical therapies. Hyperoxia is created by dissolving the O2 in the blood plasma that is achieved by breathing it under a higher atmospheric pressure inside specially designed chambers. Hperoxia produces a wide chain of physiological process in the patient organism and is prescribed by the physicians for diverse treatment to deal with various diseases. Just What is Hyperbaric Oxygen therapy? Hyperbaric Oxygen Treatment (HBOT) involves breathing pure oxygen at higher than atmospheric pressures in an enclosed chamber. This process causes oxygen to be absorbed by all body fluids and by all body cells and tissues, even those with blocked or reduced blood flow. This increased flow of oxygen stimulates and restores function to damaged cells and organs, including those of the liver and brain. The air we normally breathe contains 21% oxygen, 78% nitrogen, with the remaining 1% being contributed by the noble gases and carbon dioxide. The concentration of these gases is determined by the atmospheric pressure which is determined by the weather and is reduced at altitude. Unfortunately the variations in this pressure are ignored in general medical practice. Atmospheric pressure is accorded the unit 1 to represent atmospheric pressure absolute (1 ata) and this unit is divided according to the percentages of the gases in air to give their ‘partial pressures’ that is the part of the total pressure each gas is responsible for – oxygen therefore being 0.21 ata (21% of 1) and nitrogen 0.78 ata (78% of 1). A hyperbaric chamber is needed to allow the pressure around the body to be increased. The technology is very well established, in fact all commercial aircraft are hyperbaric chambers equipped with oxygen breathing systems. In Hyperbaric Oxygen therapy, purified Oxygen is inhaled under high atmospheric conditions, increasing Oxygen concentration within the body, and alleviating effects of Oxygen deficiency. Greatly increases Oxygen concentration in all body tissues, even with reduced or blocked blood flow. Stimulates the growth of new blood vessels to locations with reduced circulation, improving blood flow to areas with arterial blockage. Stimulates with an adaptive increase in superoxide dismutase (SOD), on of the body’s principal, internally produced antioxidants and free radical scavengers. Aids in the treatment of infection by enhancing white blood cell action and potentiating germ-killing antibiotics. Approximately six million Indians have wounds that do not heal. Chronic leg ulcers can be vascular, arterial or diabetic ulcers. They may have diabetes, poor circulation or other health conditions that increase their risk for chronic or non-healing wounds. 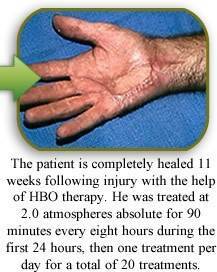 Hyperbaric oxygen therapy has had great success in the healing of non-healing diabetic wounds on the feet. 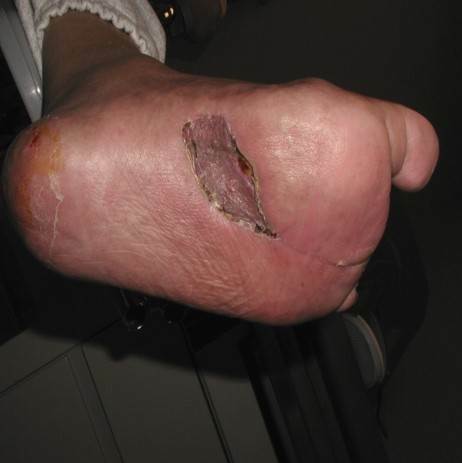 Diabetic Wounds such as ulcers are the most common diabetes related foot injury that can require lower extremity amputation. Diabetics generally heal slower than most due to reduced blood flow to the infected areas. HBOT stimulates and accelerates the healing through the formation of collagen and new blood vessels. 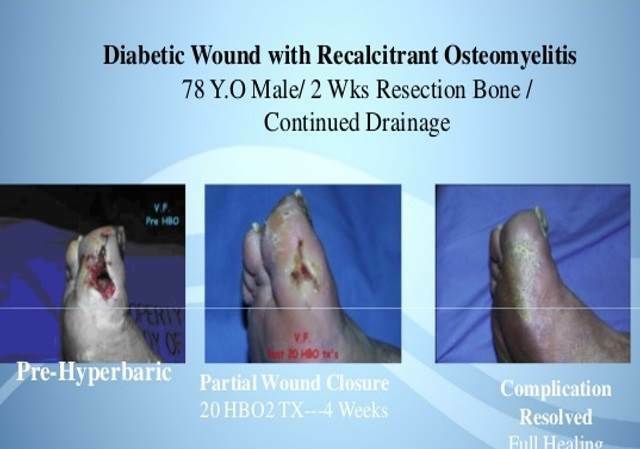 Diabetic ulcers and wounds are a great example of wounds that can be treated with hyperbaric oxygen. Research has shown a significant decrease ion amputation rates when using hyperbaric oxygen particularly in patients where surgery is not an option. HBOT can often reverse the damage and effects of poor circulation and help avoid amputation. Venous Ulcers: Effective therapeutic help that accelerates healing and recovery from injury due to anti – inflammatory effects, brings more Oxygen to the tissues and stimulates collagen formation. Post Surgical Wounds: Accelerates healing times due to the anti – inflammatory effects stimulating the formation of collagen. Hyperbaric oxygen (HBOT) is an adjunct to traditional treatments for thermal burns. HBOT slows the progression of skin and lung damage and reduces swelling. 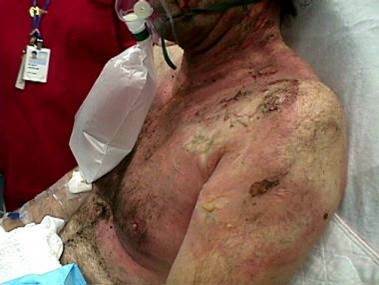 Therapy is considered safe even for patients with severe and extensive burns. By helping the body ﬁght infection, hyperbaric oxygen can improve healing, lessen damage from infection, and thereby decrease the chance of death associated with severe burns. Reducing the healing time for a burn can lessen scaring as well as improving the body's ability to ﬁght infections. Paralysis: The Secret to Growing New Brain Cells: Sleep,Exercise & Hyperbaric Oxygen? MULTIPLE SCLEROSIS : Multiple sclerosis is an enigmatic disease that is thought to have immunologic origins with resultant breakdown of the blood brain barrier. Hyperbaric oxygen therapy effects on MS have been published in a variety of studies, but the fact remains that the most rigorous study on this subject matter showed an unequivocal beneficial effect of HBOT. Stroke happens when blood is stopped from flowing to a particular part of the brain. This lack of oxygen to the brain causes affected brain cells to die which can cause lasting damage. Blood can stop flowing to the brain for two reasons. The first is a blood clot. When a blood clot lodges in a vessel that carries blood to the brain it stops the flow and causes a stroke. This type of stroke is called an Ischemic Stroke. Another type of stroke is called the Hemorrhagic Stroke. A Hemorrhagic Stroke is the result of a weak vessel in the brain that bursts and causes blood to leak into the brain. Symptoms of a stroke vary depending on what part of the brain is affected and what type of stroke the person has experienced. Common symptoms include clumsiness, confusion, memory problems, dizziness, balance and coordination problems, muscle weakness on one side of the body, mood changes, vision changes and problems with talking or walking. Hyperbaric Oxygen Therapy is being used to improve the quality of life for stroke victims. 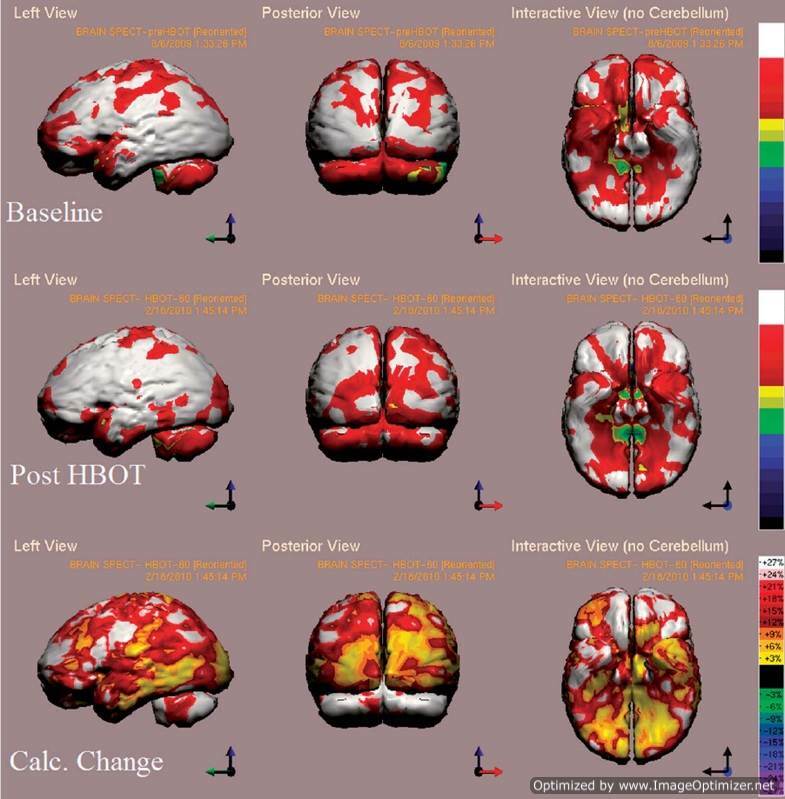 HBOT can help with the residual effects of stroke even years after the event. 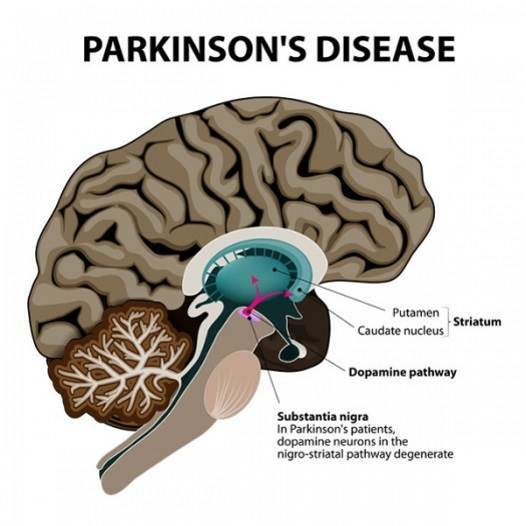 5 patients with a history of Parkinson’s Disease (PD) were treated with Hyperbaric Oxygen Therapy (HBOT) for 1 hour at 1.5-2.0 ATA. All 5 patients reported a decrease in tremors and an improvement in general well-being. The patients under went an initial course of 10 treatments and were allowed to continue treatment as needed until they perceived a plateau in benefit. The treatment benefit appeared sustained for approximately 1-5 months, and was re-established following additional HBOT. There were no complications. HBOT is a safe and effective treatment option for patients with PD. This physician’s 86 year old mother with a 15-year history of PD and tremors at rest, bradykinesia, sleep disturbance, and depression taking 5 medications for PD under went a course of 10 HBOT at 1.5 ATA. 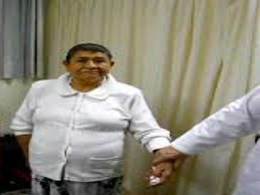 She reported an improvement in well-being and was observed to have a decrease in tremors. She underwent an additional 3 HBOT at 1.5 atA. The beneficial effects of the treatment appeared to be sustained over the course of the next 4 months. This 75 year old former corperate vice president with a 6 year history of PD taking dopaminergic drugs with resting tremors, difficulty with balance, and insomnia underwent 20 HBOT at 1.5 ATA and 3 treatments at 1.75 ATA. There was a significant improvement in tremors, balance, and insomnia, which has been maintained for 5 months. The tremors began to return, and the patient underwent 5 additional HBOT treatments with an improvement in symptoms. This 63 year old former fire fighter with a 6 year history of PD like symptoms diagnosed with PD 4 years ago had discontinued his dopaminergic agents, but continued taking amantadine for his tremors without effect. He underwent 30 HBOT at 2.0 ATA and had a complete resolution of his right hand tremor, which has been maintained for the last 5 months. This 69 year old practicing physician with a 3 year history of PD on dopaminergic medication had discontinued driving and reported difficulty in writing, episodes of rigidity, and always feeling “washed out”. Afetr one HBOT treatment at 1.5 ATA, he reported feeling like “his own self again”, and after 7 treatments resumed driving. The treatment benefit appeared to last for 24 to 48 hours- the end point of the benefit strongly related to stress experienced at work. The patient underwent 13 additional HBOT treatments at 2.0 ATA (20 treatments total), and he reported a complete resolution of symptoms for 1 month. The “washed out” feeling returned and after undergoing and additional 2 HBOT treatments, he again felt “well”. HBOT is a safe, easily administered, and relatively inexpensive treatment. K.H. 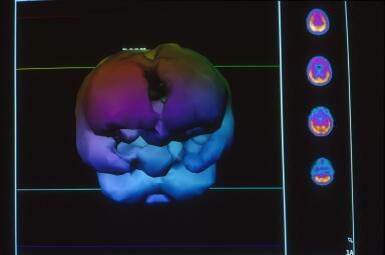 Holbach reported that HBOT treatment at 1.5 ATA resulted in a balanced cerebral glucose metabolism, which indicated an improved oxygenation and energy production of the injured brain. In this preliminary study to determine if HBOT could play a role in treatment of PD, patients were treated, depending on the severity of their symptoms, from 1.5-2.0 ATA. The treatment ATA and the number of treatments were determined by the patient symptoms in relation to their subjective perceived benefit of treatment and the observations of the patient’s spouses or care givers. The positive preliminary results reported in this small group of patients may be due to a placebo effect. A prospective study using a constant ATA and objective assessment of effectiveness should now be performed to further evaluate the role of HBOT in the treatment of PD. 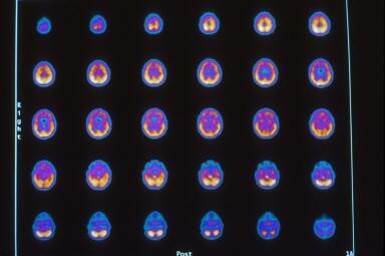 The Secret to Growing New Brain Cells: Sleep,Exercise & Hyperbaric Oxygen? A 33-year-old drunk driver wraps his pick-up truck around a tree and is brought to the emergency room at a small, community hospital in Slidell, Louisiana. His emergency room doctor, Dr. Paul Harch, recalled the scene. “You know, high-speed, straight into a pick-up, no seatbelt, and the flexion injury rendered him paralyzed immediately. By the time they got him off the floorboard of the truck…he had a flicker of movement in his one big toe; within forty minutes he was densely paraplegic. At three in the morning the neurosurgeon, radiologist and myself looked at each other and the only explanation was that he had a vascular injury to his spinal cord. And almost in unison we said, “Gosh, I wonder what he could do with a little oxygen?” I put him in the hyperbaric chamber and he moved his toe. When we took him out, he had sensation down in the foot. Incrementally, every time I put him in, he got more and more sensation. Multiple sclerosis is an enigmatic disease that is thought to have immunologic origins with resultant breakdown of the blood brain barrier. 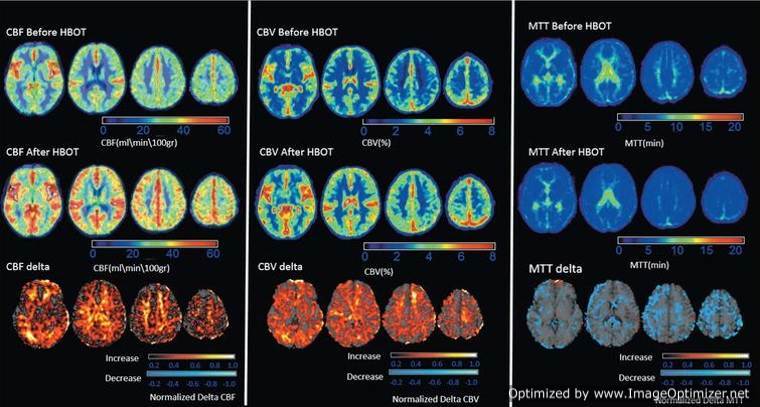 Hyperbaric oxygen therapy effects on MS have been published in a variety of studies, but the fact remains that the most rigorous study on this subject matter showed an unequivocal beneficial effect of HBOT. They are usually found in people over the age of 60 and are more common among women. There is a connection between White Matter Hyperintensities and cognitive decline, dementia, stroke and death but wheather that is due to the age of the individual or the lesions themselves is still unclear. 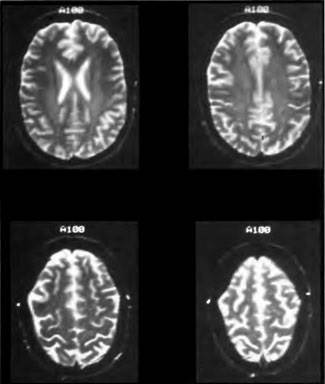 There is evidence that White Matter Hyperintensities indicate Ischemia. Hyperbaric Oxygen Therapy able to improve cognitive function of individuals with White Matter Hyperintensities by increasing the flow of oxygen to the brain and improving circulation. Autism is a complex neurological disorder that typically occurs within the first three years of child life that results in usually severe developmental disability. Its incidence in the population is estimated to be 1 in 500 with a prevalence of 75% boys to 25% girls. The ensuing effects of the disease result in severe impairment in areas of social interaction and communication and in some individuals self-injurious behavior may occur. Recently hyperbaric oxygen therapy (HBOT) has shown to be of possible benefit in the treatment of this disease. Initial results of the HBOT treatments were objective improvements in a variety of diverse phenomenons. Each child demonstrated global reduction in aggressive behaviour. All children were reported to be easier to engage when the parent wished to initiate communication with marked improvement of direct eye contact. All children were improved with regard to understanding verbal commands. Reasoning abilities were noticeably enhanced in all individuals. 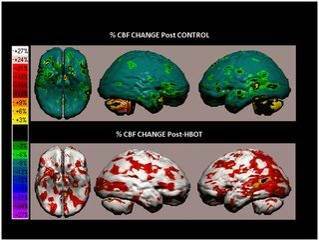 Clinical improvement was substantiated by pre and post treatment SPECT Scan Brain Imaging which displayed enhanced neurophysiologic function. 6	With a total "Dive" time of 60 minutes per treatment. Patients were treated for 5 days consecutively with two days off. Near-drowning occurs when you’re unable to breathe under water for a significant period of time. During near-drowning, oxygen intake decreases and major body systems shut down from the lack of oxygen flow. In some cases (particularly in young children), this can happen in a matter of seconds. The process typically takes longer in adults. HBOT is best proven treatment to treat such patients. Fibromyalgia: Helps decrease pain points and symptoms for faster recovery of the patient. Chronic Fatigue: Decreases symptoms from their actions achieving recovery of patients there by improving their quality of life returning to their previous activities. 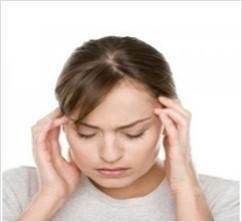 Migraine Headaches: Symptoms reductions during the episode and reduction of number of episodes. 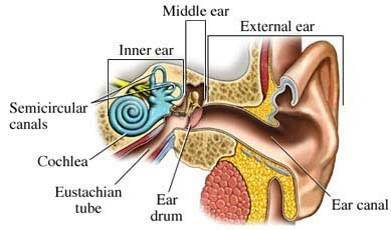 Tinnitus: Removes and reduces unwanted noise generated by middle ear inflammation. Elderly: Increases the Oxygen in the tissues recovering joint and muscle mobility and improving circulatory deficiencies with increased cerebral perfusion, which prevents and relieves neurological disorders. Trauma: Speeds healing and functional recovery, quickly reduces inflammation and edema. Pre and Post-Surgery: Makes more efficient the process of wound healing and repair. 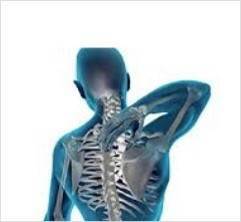 Kinesiology: Helps and speeds recovery time of rehabilitation. Ligament Injuries: Accelerates the recovery and rehabilitation of tissue, ligament, tendon, joint, muscle and bone injuries, increasing the effectiveness of treatment. Osteomyelitis: Increases the bactericidal action of cellular immunity and increases the blood supply to the bone facilitating the advent of antibiotics. Bone Grafting: HBOT leads to a significant increase of Oxygen supply in poorly per fused tissue several physiological mechanisms of this treatment modality are suitable for having a positive effect on infected large autologous free bone transplants. Fractures: HBOT helps the patients who have delayed healing or established non-union of bony fractures. Brain injury is an injury to the brain caused by an external force that causes either temporary or permanent damage. Common causes of brain injury include contact sports, vehicle accidents and violence. Symptoms of brain injury include drowsiness, lethargy, severe headache, weakness in extremities, dizziness, loss of vision, slurred speech,vomiting,nausea etc. Treatment for brain injury will vary depending on the severity of the injury and can range from mild treatments such as medications to more invasive procedures such as surgery to relieve swelling and bleeding around the brain. Hyperbaric Oxygen Therapy has helped to reduce the permanent effects of brain injury and aid in faster healing. Concussion is a mild traumatic brain injury. Post Concussion Syndrome takes place when symptoms such as headache and dizziness last for weeks maybe even months after the injury that caused the concussion takes place. No single test will determine if someone has a concussion, most doctors will order an MRI to determine a concussion. To provide proper treatment it is often best to keep a list of questions to ask the doctor as well as sequence of events that cause the initial concussion. Hyperbaric oxygen therapy has been shown to cut the recovery time and aid in the healing process of Post Concussion Syndrome. Hyperbaric Oxygen Therapy Can Improve Post Concussion Syndrome Years after Mild Traumatic Brain Injury. Reflex sympathetic dystrophy (RSD) is a clinical syndrome of variable course and unknown cause characterized by pain, swelling, and vasomotor dysfunction of an extremity. This condition is often the result of trauma or surgery. Limb immobility may lead to RSD; RSD in a hemiplegic upper limb after stroke is often termed shoulder-hand syndrome. 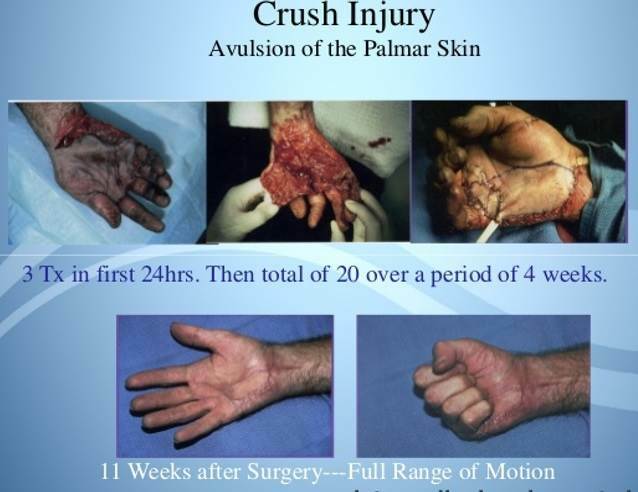 Crush injuries and compartment syndrome are acute traumatic ischemias related with complicated wounds following severe physical injury. Crush injury may be caused by severe blows, great weight, automobile, gunshots and other accidents. Complications such as amputation and non-healing bone fractures may arise. Compartment syndrome results when pressure builds within the body after surgery, muscle strain or injury. Muscle death or nerve damage may be a result. Compartment syndrome has been found wherever a compartment is present: hand, forearm, upper arm, abdomen, buttock, and entire lower extremity. Physical signs of compartment syndrome can range from severe pain at rest or with any movement to the limb that is affected feeling hard or as if it is filling with fluid. Osteomyelitis is an infection of the bone. Infections that spread to the bone typically get there via nearby tissue that has been contaminated or bloodstream. It can also begin in the bone itself by germs that are acquired through injury. While Children are more prone to develop in arms and legs (typically longer limbs), adults are more likely to develop in the bones that make up the spine. Individuals who are diabetic and suffer from foot ulcers are at risk to develop osteomyelitis in their feet. 1. Aids in strengthening osteoclast, bone cells that reabsorb dead bone, permitting the osteoclasts to remove bony debris more efficiently. 2. Improves the immune system by giving the white blood cells sufficient oxygen. Hyperbaric Oxygen Therapy is used in conjunction with antibiotics do to the fact that it supports the action of the antibiotics. 3. 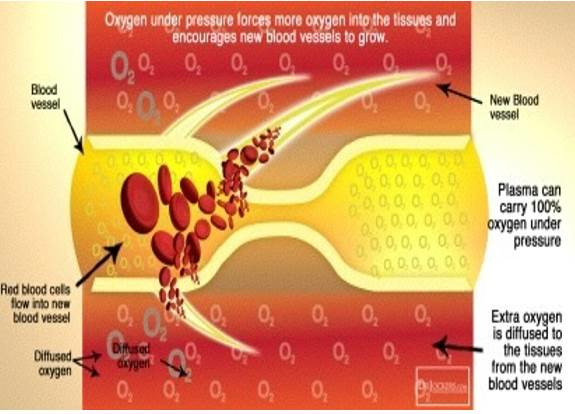 Due to hyperbaric oxygen therapy the body will begin to produce new blood vessels called capillaries. Combining these three factors of Oxygen Therapy the body is able to create new bone while getting rid of the diseased bone. Periodontal Disease is a gum disease that includes both Gingivitis and Periodontitis. It is an infection of the gums and other supporting tissues of the teeth including the tooth sockets. Periodontal disease causes inflammation of the gums and other supporting tissues of the teeth. Periodontal Disease begins with deposits of plaque on the teeth. Plaque is made up of bacteria, mucus and food debris and deposits on the teeth over the long term can become tarter deposits which attach to the lower portion of the exposed tooth. The deposits of tartar are a major cause of tooth decay and will eventually irritate and inflame the gums. When gums become infected they may be swollen, bleeding and tender to the touch. If Gingivitis progresses to Periodontitis loss of bone surrounding the teeth can occur eventually leading to tooth loss. Treatment will include a thorough cleaning to remove deposits form teeth and reduce inflammation of the gums. Proper oral hygiene is the best way to avoid a reoccurrence of Periodontal Disease. Hyperbaric Oxygen Therapy has been beneficial as part of the treatment of Periodontal Disease. Case studies have shown a reduction in healing time and gum swelling. In some cases, HBOT may be able to prevent tooth loss. 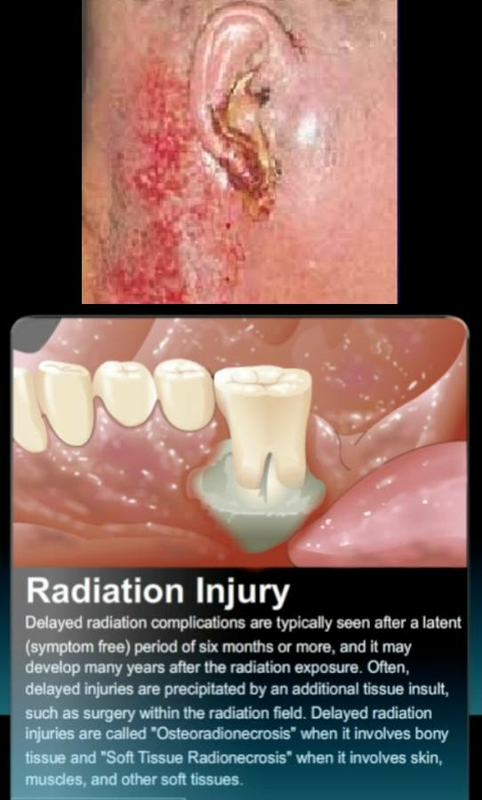 Radiation injuries have many possible sources and can range from very mild to severe. A mild form of radiation injury is caused by too much exposure to the sun or tanning beds. This type of radiation can cause skin damage, premature aging and skin cancers. Some forms of skin cancer such as Melanoma can be serious if not treated quickly. Medical procedures are also sometimes responsible for radiation injuries. 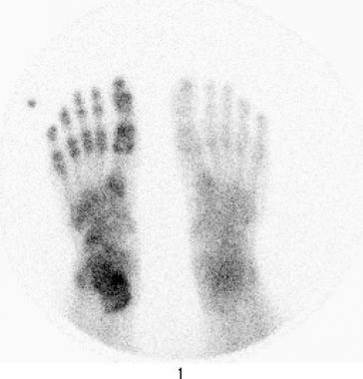 Overexposure to X-rays and CT scanners can cause skin injuries including rash, burn and possibly tissue death. 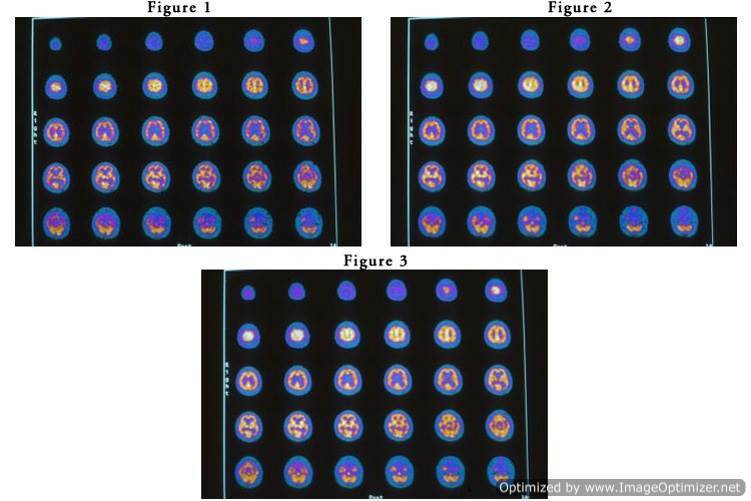 Radiation therapy used as cancer treatment can also cause radiation injury. This type of injury is called Osteoradionecrosis and is a result of radiation destroying not only harmful tissue such as a tumor but healthy tissue too. 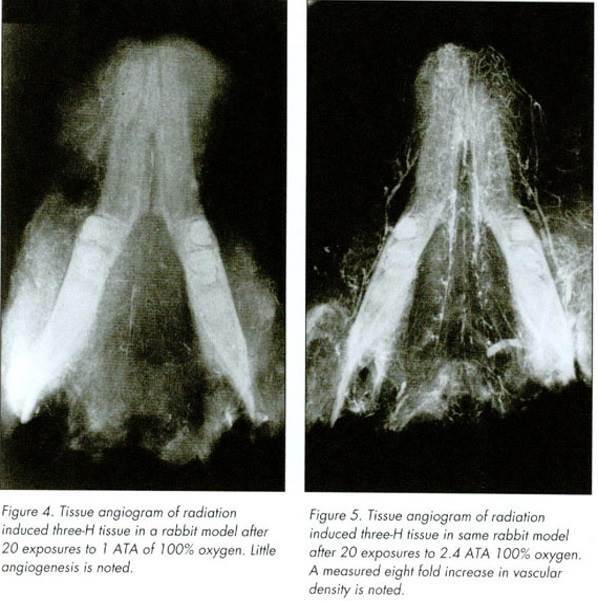 Any tissue can be affected by radiation treatment including bone tissue. The mandible is most often affected due to radiation treatment for cancers or tumors in the head and neck area. Hyperbaric Oxygen Therapy is known to be an effective treatment for Radiation injury. HBO2 induces neovascularization in hypoxic tissue. HBOT improves blood circulation, delivers oxygen to the damage tissue and can help reduce scarring. Laryngeal Cancer is a cancer of the larynx. The larynx also known as the voice box is located at the front of the neck.Cause may be race, smoking, alcohol, history of head and neck cancer, and occupation (exposure to sulfuric acid mist or nickel). Symptoms can include: weight loss, bad breath, earache, hoarseness or other voice changes, problems breathing, lump in neck, cough that doesn’t go away and sore throat or feeling of something stuck in throat. Diagnosis of laryngeal cancer can include: physical exam, indirect laryngoscopy, direct laryngoscopy, CT scan and biopsy. Cancer of the larynx is usually treated by radiation, surgery or chemotherapy. Laryngeal radionecrosis, successfully treated by use of hyperbaric oxygen (HBO) therapy, in which laryngectomy was avoided. 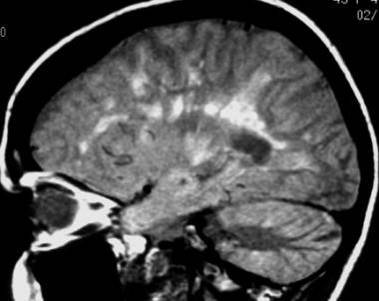 A 67-year-old male received radical chemoradiotherapy (CRT) for mesopharyngeal cancer, which included radiotherapy with a total dose of 71.4 Gy/38 Fr and chemotherapy with CDDP + S-1. He developed dyspnea and throat pain 9 months after completion of CRT. Laryngoscopy revealed vocal cord impairment because of severe laryngeal edema. 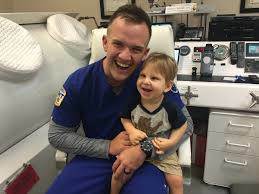 He was diagnosed as having laryngeal radionecrosis and initially received conservative therapy combined with antibiotics, steroids, and prostaglandins. Because his dyspnea was persistent despite this treatment, HBO therapy was administered 20 times, and resulted in complete remission of the dyspnea. HBO therapy, therefore, is regarded as an effective conservative therapeutic option for laryngeal radionecrosis. 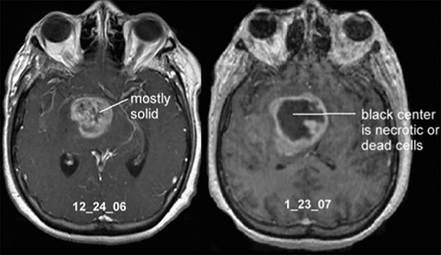 Glioblastomas are malignant tumors associated with the nervous system. They are usually found in the brain and spine of adults although they are most commonly found in the brain. This is a fast growing tumor which develops form supportive brain or spinal cord tissue. 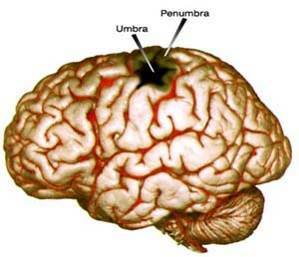 Symptoms of Glioblastomas are both physical and behavioral. Physical symptoms include headache, dizziness, clumsiness and seizures. Depending on both the size and location of the tumor individuals may also experience loss of vision, loss of speech, loss of hearing and problems relating to motor function. Treatment includes surgery to remove as much of the tumor as possible without damaging surrounding brain or spinal tissue. Because this type of tumor is attached to surrounding tissue it is usually impossible to remove the entire tumor. Any remaining tumor will be treated with radiation therapy and/or chemotherapy. This helps to shrink what remains of the tumor and inhibits further growth. The lack of oxygen in the tissue of the tumor may be a reason for lack of response to treatment such as radiation and chemotherapy. 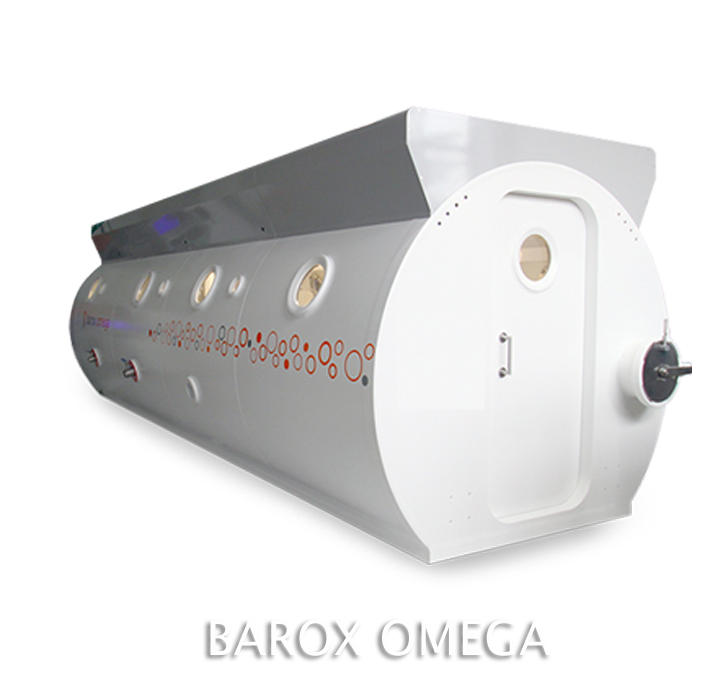 Hyperbaric Oxygen Therapy increases oxygen to the tissue increases the effectiveness of radiation and chemotherapy. 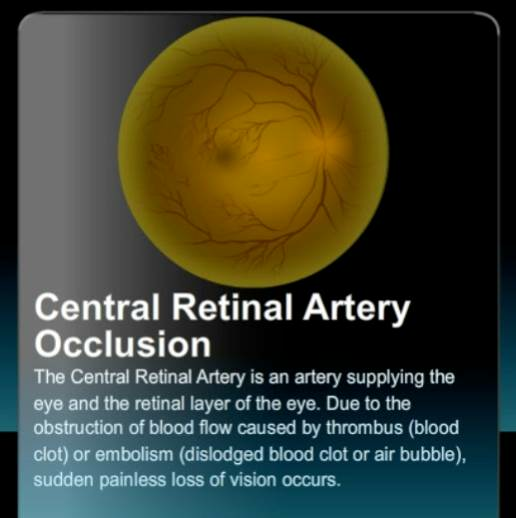 Central retinal artery occlusion (CRAO) is an uncommon eye disorder, but one that typically produces severe and irreversible vision loss in the affected eye. The retina has a dual blood supply, with the retinal circulation supplying the inner layers and the choroidal circulation supplying the outer layers. In CRAO, vision loss results from cell death in the inner retinal layers despite relative sparing of the outer layers. If supplemental oxygen is provided, however, oxygen from the choroidal circulation may diffuse in adequate quantity to the inner layers of the retina to maintain retinal function and restore vision. In some patients this can be achieved with normobaric hyperoxia; in others, hyperbaric oxygen (HBO2) may be required. The challenge is to provide the supplemental oxygen early enough after the onset of vision loss to prevent irreversible damage to the retina. In experimental models of complete CRAO, the ischemic time window before permanent retinal damage occurs is just over 90 minutes; in the clinical setting where occlusion may be incomplete, return of vision may be achieved even after delays of eight to 24 hours. Idiopathic sudden sensorineural hearing loss is classically defined as a hearing loss of at least 30 dB occurring within three days over at least three contiguous frequencies. The most common clinical presentation involves an individual experiencing a sudden unilateral hearing loss, tinnitus, a sensation of aural fullness and vertigo. The incidence is estimated at 5 to 20 cases per 100,000 annually in the United States. However, the incidence may be higher, as many cases are likely unreported. Hyperbaric Oxygen Therapy (HBOT) is gaining popularity, both for treating tinnitus and SSNHL. In both cases, it is much more effective in the early stages. In HBOT, the patient sits inside a pressurized chamber. Air pressure inside the chamber is increased to 2.5 times normal atmospheric pressure. The patient then breathes pure oxygen from a mask for 1 to 2 hours. Sessions are repeated on successive days for 10 or 15 times. Due to the increased pressure inside the chamber, far more oxygen is dissolved in the bloodstream than under normal conditions. 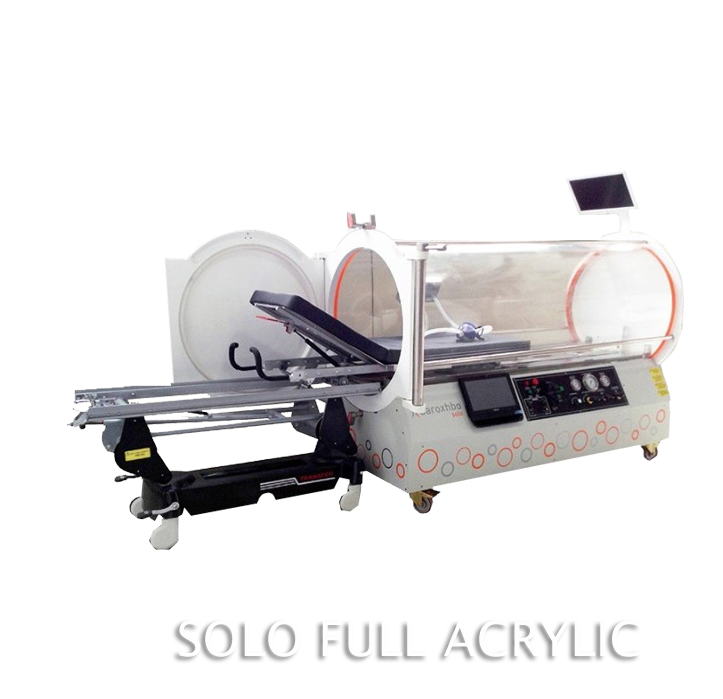 HBOT enables the oxygen content of the blood to reach up to 7%, which is 20 times higher than normal. This increases oxygen pressure in the inner ear. It has been shown that there is a profound decrease in oxygenation of the cochlea during and after acoustic stress and in SSNHL. During exposure to HBOT, the oxygenation in the cochlea increases up to 460%. (4) The hair cells in the cochlea have no direct vascular supply of oxygen and depend entirely on oxygen supplied by diffusion. An increase in oxygen compensates for oxygen deficiency caused by trauma and gives rise to mechanisms that are involved in functional recovery. Carbon monoxide is a colorless, odorless gas produced by burning material containing carbon. Carbon monoxide poisoning can cause brain damage and death. This odorless, tasteless, and colorless gas is the leading cause of accidental poisoning deaths in America. You can't see it, smell it, or taste it; but carbon monoxide can kill you. 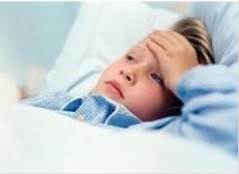 Headaches, nausea and fatigue are symptoms of Co2 poisoning that are most commonly mistaken as flu symptoms. When household appliances are not properly ventilated, the carbon monoxide that is produced by these appliances can build up and cause severe effects. Sources of carbon monoxide are as follows: Gas water heaters, Propane heaters and stoves, Indoor tractor pulls, Charcoal grills, Kerosene space heaters, Any boat with an engine, Spray paint, solvents, degreasers, and paint removers, Cigarette smoke, Gasoline powered concrete saws, Propane-fueled forklifts and Gasoline and diesel powered generators. 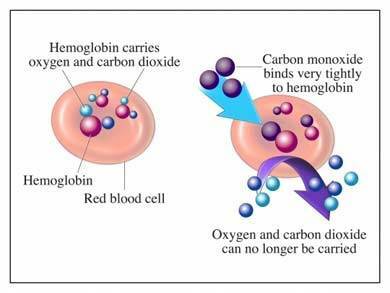 Hyperbaric oxygen therapy works by reducing the amount of carbon monoxide in the blood restoring the oxygen level back to normal as quickly as possible. Each session inside the chamber lasts for about 90 minutes. A person can recover within a few days, however it is important to keep in mind the long-term affects that may occur days or weeks after carbon monoxide poisoning. Cyanide poisoning makes the body unable to use life sustaining oxygen. Although rare, cyanide is potentially a deadly poison. 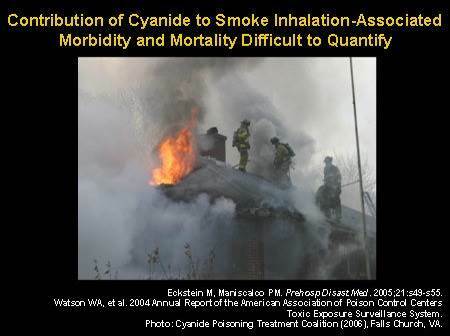 Cyanide poisoning can occur from smoke inhalation caused by a fire due to the burning of items such as silk, plastic and rubber. Other factors such as chemical research, metal processing, photography, synthetic plastics and electroplating industries that use cyanide can cause poisoning. The most common side effects are: shortness of breath, general weakness, excessive sleepiness, bizarre behavior, confusion, seizures headache and dizziness. A person that has been infected by cyanide poisoning may have pink or cherry red skin due to the oxygen staying in the blood and not getting into the cells. Very fast or slow heartbeat as well as breathing heavy may be a sign as well. Hyperbaric oxygen therapy treatments. : With Increased plasma-dissolved oxygen offers a direct benefit. Hyperbaric Oxygen Therapy can also be used to reduce the symptoms of the nervous system and if contaminated with carbon monoxide the patient may recover quicker. Training: Accelerates recovery, optimizing training, strength and muscle volume reduces fatigue to compete in better conditions. Injuries: Accelerates the recovery and rehabilitation of tissue, ligament, tendon, joint and muscle injuries decreasing the time to return to competition. Recovery after exercise (acute fatigue and delayed fatigue): Accelerates recovery after a competitive effort, enabling an athlete to be in a better position for the next competition. 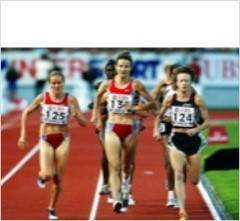 Chronic and sub acute fatigue syndrome: Recovery athletes chronic fatigue, results in increased blood perfusion in the central nervous system, acting on neuro transmitters and elasticity recovery of red blood cell. Decompression sickness occurs when there is a sudden change in barometric pressure. Underwater diving is the largest cause of decompression sickness. When a diver has a sudden decrease in pressure during underwater ascent, nitrogen bubbles can form in the body tissue rather than being exhaled. These nitrogen gas bubbles can cause severe pain, known as "the bends". Different parts of the body can be affected depending where the bubbles are located. Decompression sickness symptoms can vary. Some may experience itching, rashes or bubbles under the skin. Other symptoms may be joint pain, sensory disturbances, bladder problems, chest pain, cough and shortness of breath. 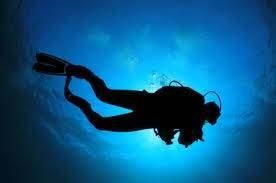 If a diver has decompression sickness most will show signs within the first 24 hours. Some injuries form decompression sickness requires immediate medical attention, while others can wait for treatment. It is always best to plan ahead when chances of decompression sickness can be a factor. Always know the location of the nearest emergency room and facility equipped with a Hyperbaric Chamber. Recompression therapy was first proven to work in1896. Oxygen therapy was proving to work in animals that had decompression sickness. Hyperbaric oxygen therapy will immediately reduce bubble volume while increasing the diffusion gradient for inert gas from the bubble into the surrounding tissue. 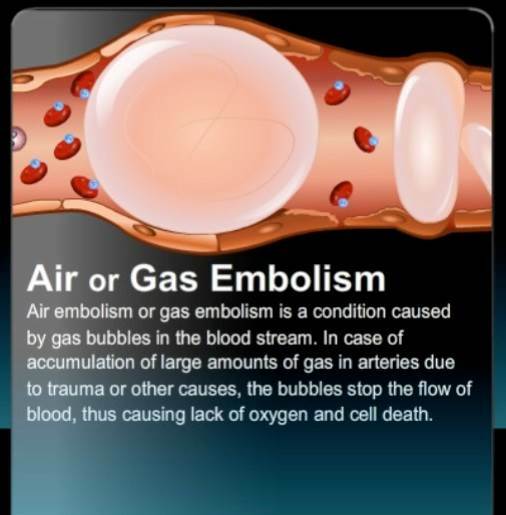 Air or Gas Embolism is caused when gas bubbles enter the arteries, veins and/or capillaries. It can take place as simple as small amounts of air getting into the blood circulation accidentally during surgery or other medical procedures (for example a bubble entering an intravenous fluid) and can be a consequence associated with diving. When a diver's airway is shut on ascent the expanding air in the lungs can provoke a rupture of the alveoli, thereby causing air to move into the arteries. Air or Gas Embolism can cause impaired vision or blindness and paralysis in the limbs as well as damage to the brain, heart, lung and other organs. Injury can be so severe that complete disability can result leaving the victim limited to walking with canes, crutches or walkers. Those more severely injured may even be restricted to a wheel chair or bedridden. Swelling may occur when vessels that are obstructed leak fluid into the surrounding tissue, caused by gas embolism. When using Hyperbaric Oxygen Therapy, the pressure inside the chamber reduces bubble size and forces the left over gas outside the circulation, while the high oxygen pressure washes out unmoving gas from the bubble. Once bubbles are smaller or dissolved blood flow will resume and the tissues start to receive a higher level of oxygen delivery. Anoxia is a serious form of Hypoxia in which levels of oxygen in the blood are dangerously low. Anoxia causes a general lack of oxygen supplied to the body or to specific tissues or organs of the body. Anoxia can affect any tissue or organ of the body and is a serious condition which requires immediate emergency care. Cerebral Anoxia is the most serious form of Anoxia as brain cells can die within minutes of being deprived of oxygen. Anoxia can be caused by a lack of oxygen due to very high altitudes, blood which is unable to carry oxygen to tissues or organs, the inability of the heart to distribute oxygenated blood or respiratory failure which inhibits the ability to transfer oxygen form the lungs to the blood stream. Babies during childbirth and older adults with risk factors for heart attack and stroke are more likely to experience Anoxia. Symptoms include confusion, dizziness, labored or difficult breathing, altered thought process, unconsciousness and coma. Emergency medical care should be sought immediately if any of these symptoms are present. Complications include amnesia, cardiac arrest, dementia, hallucinations, memory loss, confusion, seizures and vegetative state. 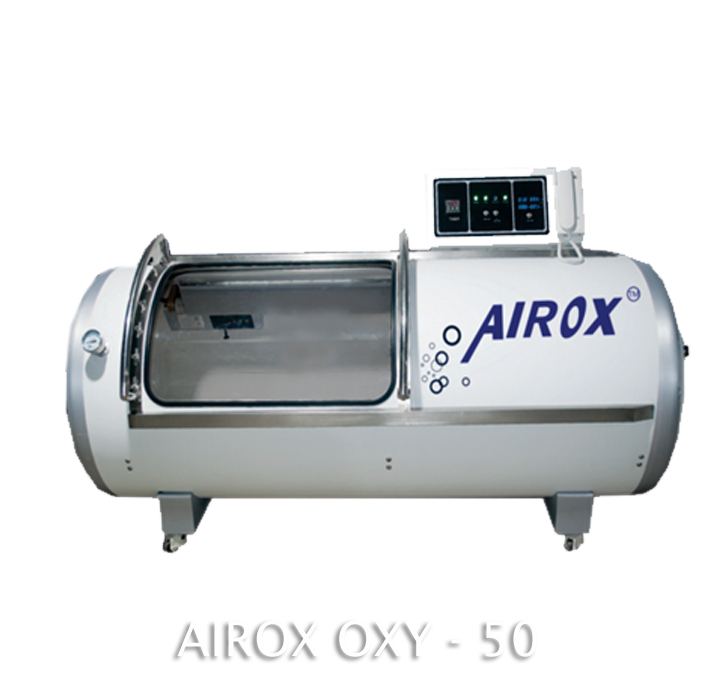 Hyperbaric Oxygen Therapy for individuals who have experienced Anoxia can increase oxygen levels, improve blood circulation and the transport of oxygen through the blood stream. 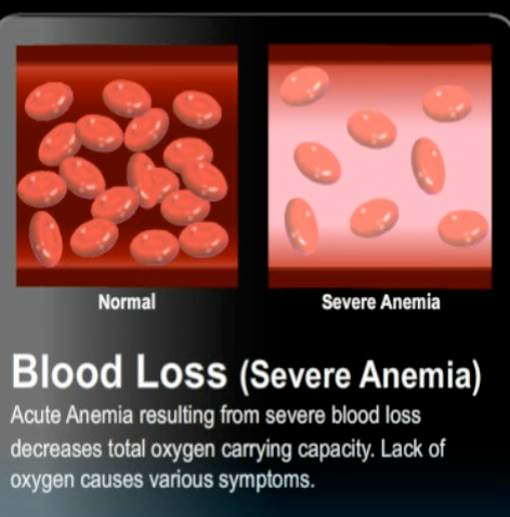 Acute blood loss anemia (severe anemia) typically occurs when there is an immense amount of blood loss. Blood loss over a short period of time can reduce the amount of iron in the body, so much so that the bone marrow will no longer be able to increase production of new blood cells to replace the lost ones. In macrocytic anemia the blood cells are larger than normal and can be caused by anemia related to alcoholism and pernicious anemia. Symptoms of severe anemia may include the following: dizziness, chest pain, angina or heart attack, rapid heart beat rate and fainting or passing out.